Large-scale puppy mills currently face few regulations in Wisconsin. However, after reports of inhumane conditions at those types of facilities, State Senator Alberta Darling (R-River Hills) says it&apos;s time to impose guidelines. Darling is co-sponsoring legislation that would require facilities that breed more than 50 dogs a year and have more than eight breeding dogs to be licensed and regulated by the state. 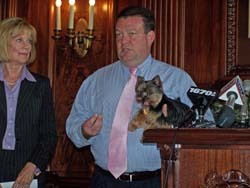 The bill would allow state officials to investigate reports of puppies being raised under improper conditions. State Senator Jeff Plale (D-South Milwaukee) says it also helps consumers who are sold unhealthy dogs get compensation, either by replacing the animal or paying back double the vet bills wracked up by an unhealthy dog. Several other states already have regulations in place on puppy mills.